The Masonic Lodge 206 held a breakfast at Presbyterian Church on May 5 to benefit the Special Olympics. From left are Larry Harden, Zack McAvoy, Larry Hildebrand and Tom Geyer helping cook and served the breakfast to more than 100 people. 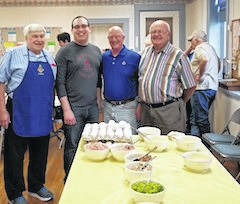 https://www.morrowcountysentinel.com/wp-content/uploads/sites/29/2018/05/web1_20180505_094231.jpgThe Masonic Lodge 206 held a breakfast at Presbyterian Church on May 5 to benefit the Special Olympics. From left are Larry Harden, Zack McAvoy, Larry Hildebrand and Tom Geyer helping cook and served the breakfast to more than 100 people.